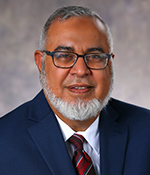 Imran Ali joined The Trust in May 2014 and more recently in September 2015 served as interim president and CEO. Mr. Ali began his extensive career in social services working with Guyana’s Department of Public Assistance. In 1981, he relocated to Miami-Dade County where he began working for Florida's Department of Children and Families (DCF). At DCF he held progressively responsible positions including director of operations for all DCF programs and director of child welfare. Under his leadership, the district received a national award from the Department of Human Services in Washington, DC, for the highest number of adoptions in the state of Florida. Mr. Ali also served on President’s Clinton Adoption Committee in 1994. Additionally, Mr. Ali served as program director for the Children’s Home Society of Florida and as chief operating officer for the Family Resource Center of South Florida. He has participated in many local, state and national committees, all focused on providing children the opportunity to grow up in a safe, secure, stable and healthy environment. In 2003, Mr. Ali was inducted into the Eleventh Judicial Circuit of Florida’s Juvenile Wall of Honor, which recognizes our community’s most distinguished child welfare leaders, advocates and experts.